Kitchenaid mixers are considered the premium stand mixers by many people – but without knowing the Kitchenaid mixer dimensions can you be sure it will fit in your kitchen? Wouldn’t you feel a bit silly returning your brand new stand mixer because your cabinets knocked it over? They are among the more expensive kitchen mixers you can purchase, and in most cases you get what you pay for in terms of ease of use, reliability, and capability to handle your toughest baking job. None of which does you any good if the dimensions of the mixer won’t allow it to sit on your counter or in a nearby pantry. So what are the dimensions of a Kitchenaid mixer? Although most people are worried about the height, you can’t overlook the weight as well. With some of the heavier duty mixers weighing in at 29 pounds, these aren’t appliances you want to be moving around on a constant basis [unless it becomes part of your workout routine!]. The standard dimensions of most counter tops and the clearance to the bottom of your kitchen cabinets is 18 inches. Some kitchens will have different height dimensions between their counters and the lower end of the cabinets, so be sure you measure yours before making this size of an investment. The good news is you don’t really need to worry about mixer attachments as these fit into a drawer! The tallest Kitchenaid mixer that is normally used in home kitchens is 17 inches. In general the dimensions of these [and most other high end brands] range from 14 inches to 17 inches. Which, if you are keeping up, means you have anywhere from 1 to 4 inches of clearance from the top of your mixer to your cabinet. Note that this assumes a standard 18 in counter to cabinet height – if you are putting in a pantry you have to see what your shelf clearance will be. When mapping the dimensions of your stand mixer to a pantry storage location, also be sure and pay attention to weight. If you’re buying a 29 pound kitchen mixer you want to be sure your shelf can support the weight. Typically this means you put it near the end of the shelf assuming the shelf is supported underneath by a cross-support wood piece presumably nailed in to wall studs. If you aren’t sure how to check the weight bearing capacity of your pantry shelf, find someone who is mechanically inclined and have them take a quick look to be sure. Note that 1 inch of clearance from the top of your mixer to the cabinet isn’t much, so be sure you’re comfortable buying a mixer with a 17 inch height dimension that will be almost flush with the bottom of your cabinets. Where this comes in to play is when you are sliding it out and in before and after using the mixer for baking. 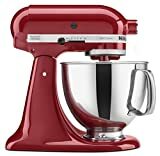 Many Hamilton Beach kitchen mixers, as well as some smaller Kitchenaid mixers, come in a few shorter sizes – if you aren’t doing large or heavy batch baking, these mixers can often be a good compromise in terms of price (many mixers under $100) and space taken in the kitchen. We show a few representative mixers below so you can get a feel for what they look like and their dimensions for reference. 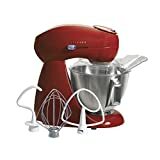 This mixer should fit comfortably on most kitchen counters tucked under the kitchen cabinets, with a height of 14 inches. At 26 pounds it is heavy, but not the heaviest of the line. Advertised as a professional grade mixer, this is one of the larger mixers available for home use, with a height of 17 inches. At 29 pounds, it is 1 pound short of the heaviest mixer we tend to recommend. This high end, very capable Hamilton Beach model checks in at a fairly short 14.37 inches, and a reasonable 19.8 pounds. If you decide to keep your mixer on the counter, you may want to consider a decorative cover. Many of the newer colors and styles of kitchen mixers are decorative in their own right, and may lend a modern or even avant guard look to your kitchen. 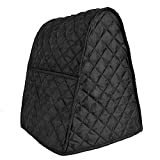 Depending on your décor, however, you may want to consider a Kitchenaid mixer cover. They also do a good job of protecting a relatively expensive investment and help it last longer. Mixer covers aren’t expensive, and honestly unless you’re doing something strange with them they should last the life of the mixer (or until your decorating style changes). Shown below are some representative covers for your Kitchenaid or Hamilton Beach stand mixer – by no means a complete collection. Note that many of these [check your mixer dimensions] also will fit other brands of mixers like Hamilton Beach or Cuisinart.